As the strongest Atlantic hurricane in recorded history continues to wreak havoc in the Caribbean, two more threats have emerged in the form of hurricanes Jose and Katia. Though it’s unusual for three hurricanes to be active in the Atlantic basin at the same time, it’s not without precedent. 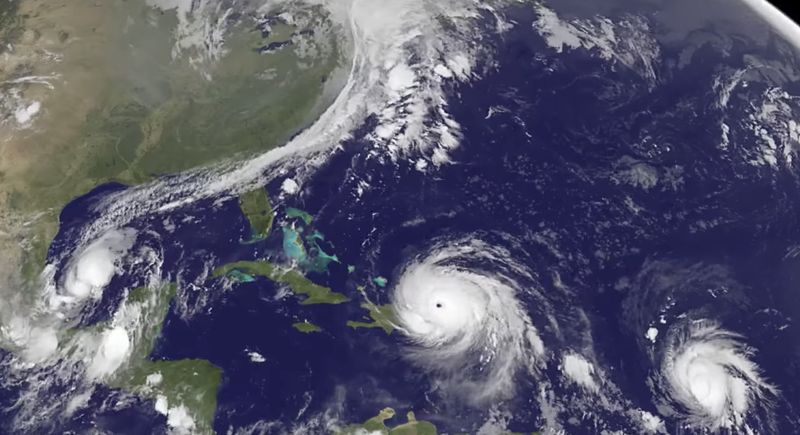 Earlier this year, scientists at the US National Oceanic and Atmospheric Administration predicted an active hurricane season—and it’s starting to become clear that they were spot on. The latest two cyclones, Jose and Katia, are now the 10th and 11th storms to be named in the Atlantic in 2017, and there are still eight tortuous weeks left in the official hurricane season. Three simultaneous hurricanes in the Atlantic basin may seem extreme, but it happens about once every ten years. “Three or more hurricanes have occurred simultaneously in the following years in the Atlantic (in the satellite era): 1967, 1980, 1995, 1998, 2010 and now in 2017,” said Jeff Masters, a meteorologist with Weather Underground, in an email to Gizmodo. So it’s been seven years since it last happened, when hurricanes Igor, Julia, and Karl appeared simultaneously in the Atlantic in 2010. Four simultaneous Atlantic hurricanes have been recorded just twice in history, once in 1893 (before hurricanes were given names) and again in 1998 (Georges, Ivan, Jeanne, and Karl). It’s a small sample size, but four concurrent hurricanes seems to be a once-in-a-century event. With all eyes fixed on the Atlantic basin, the greatest concern still lies with Irma. Now the strongest hurricane ever recorded in the Atlantic, and packing 185-mile-per-hour winds, the storm has passed Puerto Rico and is now roiling through unusually warm waters to the immediate north of the Dominican Republic. Models show it moving in a northwesterly trajectory over the next day or two, but once Irma reaches the northern tip of Cuba it’s expected to make a dramatic swing northwards, sending it directly toward Florida’s south coast. In a worst case scenario, Miami would take a direct hit. NOAA is warning that storm surges could get as high as 18 to 23 feet, both in Florida and along the Georgia coast. Hurricane Jose, another Cape Verde storm, is following in the wake of Irma, but it’s projected to travel along a more northerly path. Jose is expected to swing north by Sunday, at which time it could be a major hurricane, a Category 3 or more. It’ll get uncomfortably close to the northern Leeward Islands, which just faced the wrath of Irma. It’s still early days for Jose, so projections for this storm could change. And finally there’s hurricane Katia, which emerged in the Gulf of Mexico not far from where Harvey formed just two weeks ago. Katia is now a Category 1 storm that’s also expected to gain strength in the coming days. Unlike Harvey, which moved north into Texas, Katia is expected to move into Mexico; the storm could be a Category 3 by the time it makes landfall. It’s currently about 180 miles northeast of Veracruz, and it’s barely moving. Hurricane watches have been issued along portions of the Mexican coast. The storm is considered a “small tropical cyclone”, with winds around 80 mph and an expected 5 to 10 inches of rain. Nothing too severe yet, but nothing to trifle with either.